“CTR” stands for “Choose the Right”. At church, I teach seven year old boys and girls. 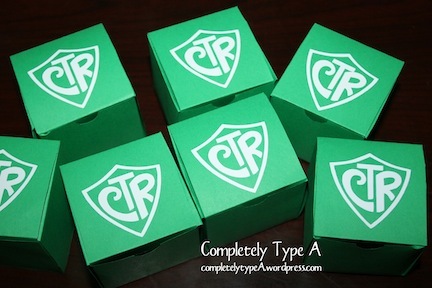 They get a ring that has the CTR symbol on them, reminding them to Choose the Right. I made these little boxes to put the rings inside. 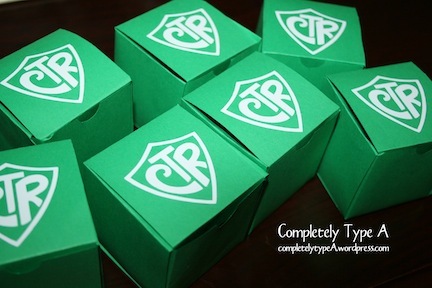 I got the template of this A-MAZING site that designs templates for any size box you want. I just put in my dimensions and printed out how many I needed. I made the white CTR logo on my Silhouette Craft Cutter. This would also be a great, inexpensive way to package a gift for baptism.